The most significant event for the organisation has been the awarding of charitable status under the UK Charity Commission as a Foundation Charitable Incorporated Organisation (CIO), registered charity in England and Wales, No. 1161673. Along with strong administrative (legal, accountancy, banking and fundraising) governance, Trustees and a 21 member Advisory Board, the foundations of the charity have now been established in just 14 months. The plaque has now been mounted at its London address of 9 Bedford Row. Human Rights at Sea CEO, David Hammond, has accepted an invitation to join the Ethics Committee of the PROMERC (Protection Measures for Merchant Ships) international project overseen by the World Maritime University. He will provide both human rights review and input to the shipping programme and he will also provide first hand experience for matters of use of force, having conceived the international 100 Series Rules a model set of Rules for the Use of Force. 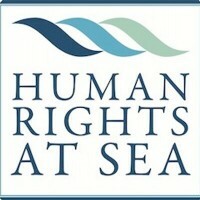 The maritime training and e-learning course provider; Marlins, has engaged with Human Rights at Sea to assist as part of its charitable objectives with input and oversight of the forthcoming Humanitarian Response training programme to be shortly released to the shipping industry covering matters concerning rescue at sea. CEO, David Hammond, took time to visit the offices of MOAS, MSF and Migrant Report in Malta during early July building on an established relationship with the MOAS founders, Regina and Christopher Catrambone. Human Rights at Sea and MOAS have agreed to work closer together and ensure greater visibility of migrant rescue work in the Mediterranean. Click HERE for the MOAS website. In recent months, the number of organisations who have joined in their support of the Human Rights at Sea charitable work has increased to 66. This includes FishWise, The Nautical Institute, Marlins, the new platform for wives and partners of merchant mariners SeaWives and CrewToo from the KVH Media Group. The ongoing case of the deprivation of liberty in India of the crew of the Seaman Guard Ohio vessel, formerly used as a floating armory by the US company AdvanFort, continues with a recent Indian Supreme Court judgment criticising the previous High Court decision and returning the matter to the lower court for potential retrial. Alongside other mainstream welfare organisations, Human Rights at Sea continues to provide support where requested and source independent legal advice for those involved. The growing Internship Programme is pleased to welcome two new international interns based in Italy and Australia. The interns have been very busy with a broad range of work supporting the charity’s objectives. As part of the administrative governance and medium-long term funding development, Human Rights at Sea now has a JustGiving account.